Posted in: Art, Music, Photography, Uncategorized. Tagged: 1979, Elysium, fashion, Gelatin silver print, Improved Photographs, Nelson-Atkins Museum of Art, Reduce/Increase, William Wegman, You Are Beautiful Just the Way You Are. 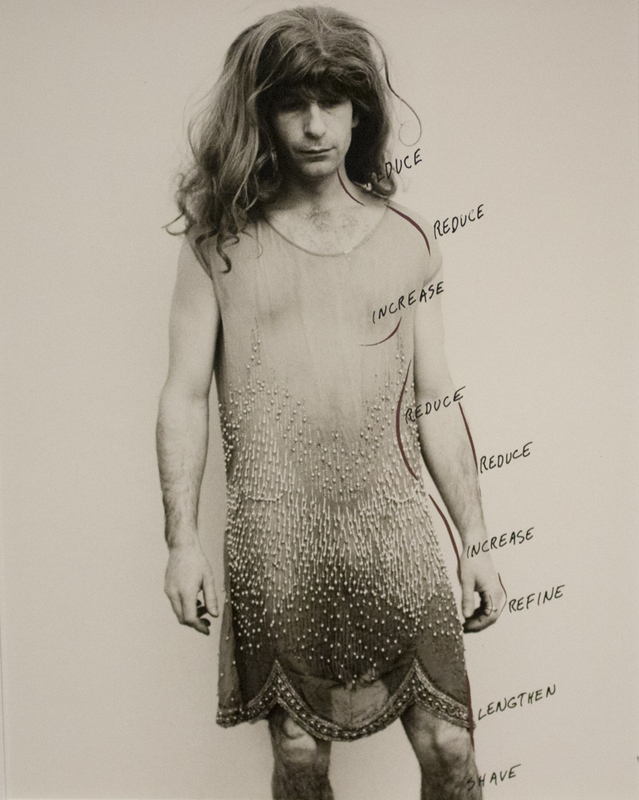 This photograph, from a series titled Improved Photographs, depicts artist William Wegman dressed as a woman. Handwritten texts on the print's surface are meant to emulate a magazine editor's comments to "improve" a model's body. With characteristic wit and humor, Wegman exposes the deceptive nature of editorial and fashion photography, while also poking fun at idealized gender norms for physical appearance. Posted in: Art, Music, Photography, Uncategorized. Tagged: 2011, Archie Scott Gobber, Enamel on canvas, Kemper Museum of Contemporary Art, Peace, Peace Train, Piece, Yusuf / Cat Stevens. Archie Scott Gobber makes art with words. 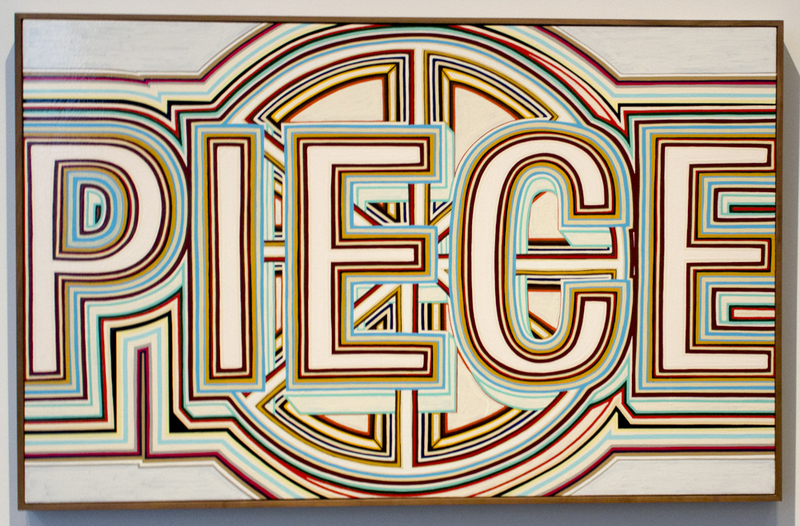 Piece could refer to a "piece of art" a phrase often used in art historical texts, or it could recall other meanings for viewers. By superimposing the word piece over a peace sign, Gobber suggests that words are rarely straightforward. "Ultimately," the artist says, "my work seeks to engage the viewer as a partner in an ongoing dialogue while realizing the goal of the artwork is what it conjures." Posted in: Music, Nature, Photography, Poetry, Uncategorized. Tagged: goats, I Whisper a Prayer for Peace, It Happens Like This, James Tate, Jazz, John Klemmer, Prince of Peace. smiled at me and admired the goat. “It’s not my goat,"
my turn caring for it.” “I didn’t know we had a goat,"
one of them said. “I wonder when my turn is.” “Soon,"
“Touching this goat will change your life," I said. Posted in: Inspiration, Music, Photography, Poetry, Uncategorized. Tagged: beauty, fasting, Jalal al-Din Rumi, love, Ney - Sükun - Calm, Ramadan. “There’s hidden sweetness in the stomach’s emptiness. Posted in: Flowers, Inspiration, Music, Photography, Uncategorized. Tagged: Bird of Paradise, happiness, Indignation, Is it Love, love, relationships, Thich Nhat Hanh. Posted in: Flowers, Photography, Poetry, Uncategorized. Tagged: D.H. Lawrence, Gloire de Dijon, Melody Gardot.